Lopa, short for Lopamudra, which is a lovely Indian name, writes about a variety of subjects, and occasionally brings forth hidden facets of the history that is commonly known, which make for interesting reading. My complaint with her blog is that she is irregular in posting. I hope she is able to contribute more regularly. That was, incidentally, the first part of the award process, which is “give credit to the awesome person who nominated you”. Since Lopa’s blog speaks for itself, that was the easy part. I will now blithely overlook the uncomfortable second part of the acceptance process, which is “describe 7 things about yourself” and move directly to the third, which is “nominate 15 other bloggers”. 3. Nominate 15 other bloggers. Through the short period I have been blogging, I have had the opportunity of reading some unique and wonderful creations, on a varied set of subjects. 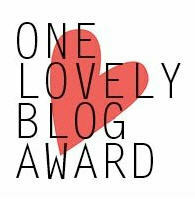 I hope to spread the joy and pleasure that I get from reading their blogs by nominating a few of them for the One Lovely Blog Award and hope that readers who stumble upon my blog will also find a way to theirs. Though unrelated to the Award, I also want to make a general request to all readers to try and leave comments on the posts they read and which touch them in some way. Thank you so much…and once again I want to say that you truly deserve this award!! Have added you to my blog roll. What did I do to deserve this treatment?? Thanks a ton. I am honoured to be on it. thanks for the nomination – much appreciated! Much gratitude, Ankur. Thank you for remembering me, even though I have been frequently hibernating the last few months! You are welcome. The length of your hibernation in no way detracts from the quality of your writing. Congratulations Ankur – thank you also for thinking of me. I’ve dropped off for about a month now and glad to be remembered. For some reason I’m not receiving updates of your posts and will ‘follow’ again. Let’s see how it goes. Thank you Eric. Hope to see more of you on yr Blog. Great, I’ll have to check all these out, so cool to come across a list of interesting blogs!